Works by Siah Armajani featured in the Grey Art Gallery’s collection date from the first decade of his artistic career, some created while he was still a college student in Minneapolis. It was there that Abby Grey met the artist and collected half a dozen works that reveal the early intellectual and artistic experimentation of Armajani, now recognized as one of the leading public artists in the United States. Armajani was born and raised in Tehran. His father, Agha Khan Armajani, a successful merchant who imported European textiles, sent his children to a Presbyterian missionary school and provided them a comfortable, book-filled home. (2) At school, Armajani learned about both Perso-Islamic culture and Western philosophy. Every evening, his father read Persian poetry to his children. At nineteen, Armajani was sent to Minnesota to study at Macalester College, where his uncle Yahya taught history. Armajani had known since childhood that he wanted to be an artist; in college, he majored in philosophy while he painted in a studio in the warehouse section of Minneapolis. There he began a series of Poetry Paintings, examples of which Abby Grey collected. String and sealing wax connect lines of painted calligraphy in Sealed Letter(1964). The first line is the bismallah, “In the name of God, most gracious, most compassionate,” an easily discernable Quranic quotation. The impulse to deconstruct the past, to question the very basis of the historical record, is reflected in another work by Armajani in the Grey’s collection, Warren Report (1965). Here he traces over parts of the printed pages of the Warren Report—the official U.S. government report on the assassination of President Kennedy. Melted sealing wax that mimics blood stains dots the report’s spine, alluding to the questionable nature of both the commission and the report it produced. 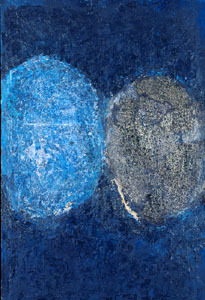 In other works, Armajani combines his interest in textuality with interests in numbers and computers. As a student, Armajani minored in math and spent time in the University of Minnesota’s computer lab. Print Apple 2 (1967) employs computerized text, but the repetitive impulse, a tendency to push language to the bounds of obscurity and render words into images, remains. The impulse to create public spaces and make art useful underlies Armajani’s art. “Kantian philosophers,” he said, “believed that art was good because it was useless. We believe that art is good because it is useful.”(5) Perhaps it is this desire to make art useful that has made Armajani one of the leading practitioners and theorists of public art in the U.S. “Public art’s basic aim,” he explained, “is to de-mystify the concept of creativity. Our intention is to become citizens again.”(6) The early works by Armajani in the Grey Art Gallery’s collection of modern Iranian art help illuminate his fundamental contributions to public art: in these works, his interests in poetry, historical memory, humanistic Sufism, populism, and democracy resonate. 1 Siah Armajani, quoted in Calvin Tomkin, “Profiles: Siah Armajani,” The New Yorker (March 19, 1990), p. 50. 2 Lisa Lyons, “The Poetry Garden,” Design Quarterly (1994): 8-30. 4 Siah Armajani, et al., “The Exuviae of Visions: Architecture as a Subject of Art,” Perspecta (1982), p. 70. 5 Armajani quoted in Dinitia Smith, “Building a Beacon for a Kingdom by the Sea,” The New York Times, July 28, 1996. 6 Armajani quoted in Jean-Christophe Ammann, “Introduction,” Siah Armajani, ed. Ammann, et al., exhibition catalogue (Kunsthalle and Amsterdam: Stedelijk Museum, 1987.